When it comes to summer, vegetables are so vibrant that we just have to make the most of them - here I grilled up courgette and aubergine slices, then layered up with beautiful mixed variety tomatoes and topped with fragrant basil oil and the new 'Mediterranean Style' Cheese from Violife (i.e halloumi), which I grilled. 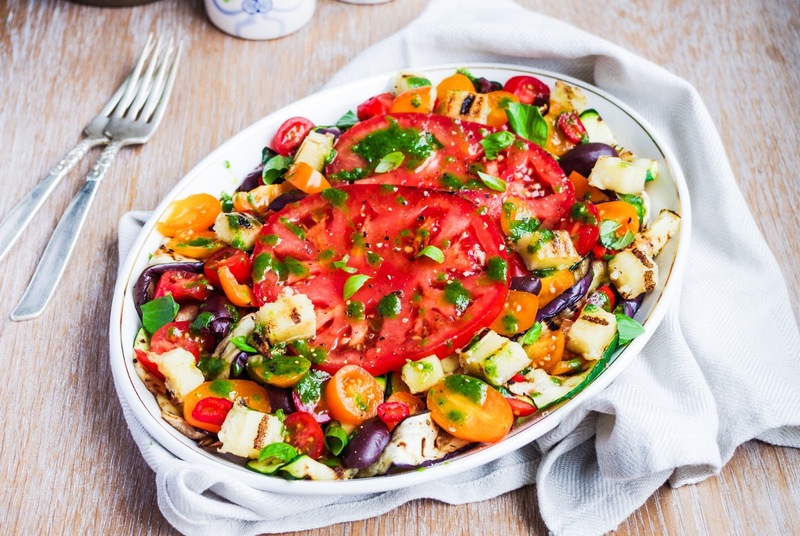 This salad really makes the most of summer produce and makes a perfect side dish for a BBQ! I was sent this new Mediterranean Style Violife variety to try out and it will be available in UK shops shortly. The pack comes with two slices, which seem pretty fragile whilst cold, so I grilled it in slices and then chopped afterwards, if you were planning on making veggie kebabs I might recommend grilling a bit first before skewering, just to tenderise it a little. 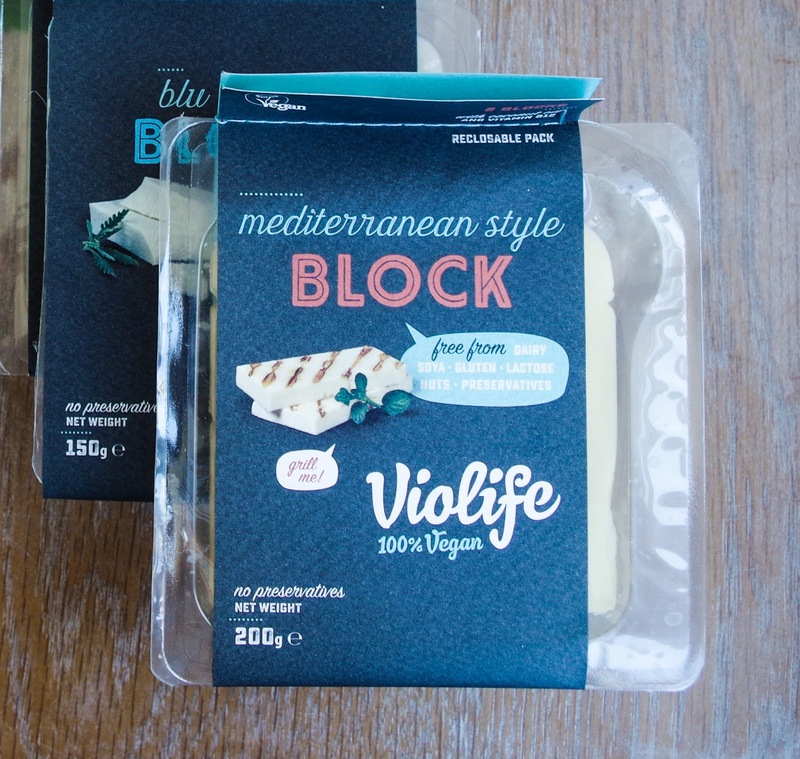 The blocks themselves now come with the addition of vitamin B12, which is great to see, as B12 can only be obtained through fortified sources in a vegan diet - so the more 'daily' products which utilise this, the better! I used a griddle pan for my cheese, though I'm sure a BBQ or even a electronic sandwich grill would work well too and would press it at the same time. Ensure your surface is searing hot before adding the cheese and then allow a good amount of char to form before attempting to turn, or it may stick to the grill. The cheese itself has a delicious, salty, halloumi-like flavour and holds its shape whilst heating, it goes crispy on the outside and softer on the inside, without being too sticky like many other varieties. It can definitely be used as a halloumi substitute without any complaints and I found myself just wanting to eat grilled pieces on its own, though it's not quite as chewy as I remember it's dairy counterpart being. I will definitely be buying this in the future and I can imagine it being a valuable asset to vegan BBQs this summer! This salad is so delicate, yet incredibly flavourful, with the grilled, seasoned veg and those incredible mixed variety tomatoes, not to mention the basil oil and the warm chewy chunks of violife, all finished off with a pop of heat from the red chili and black pepper. This dish is sure to wow at a BBQ and is packed with vitamin A, C, E, K and many others too! Add the basil, garlic clove, a pinch of salt and plenty of extra virgin olive oil to a blender, blitz until smooth and place to one side. Slice the courgette and aubergine length ways into 1/2 cm slices then grill until charred and slightly translucent. Arrange onto a serving dish and season with a splash of red wine vinegar, extra virgin olive oil, dried oregano, salt and pepper. 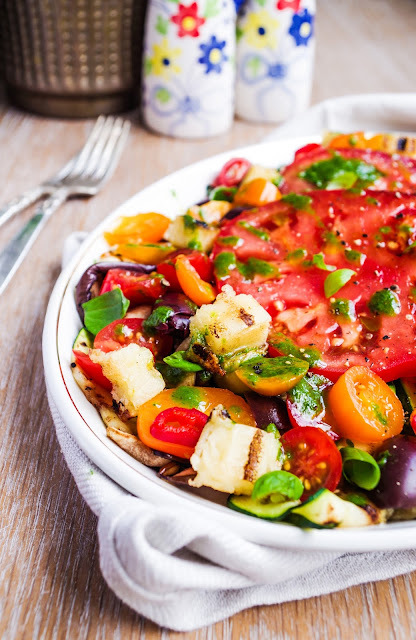 Chop the tomatoes and arrange on top of the grilled veg, along with the olives. Thinly slice the chili and scatter over the salad. Slice each block of Violife into 3 and grill until charred and warmed through. Then chop each slice into 1cm cubes. Arrange on top of the salad. 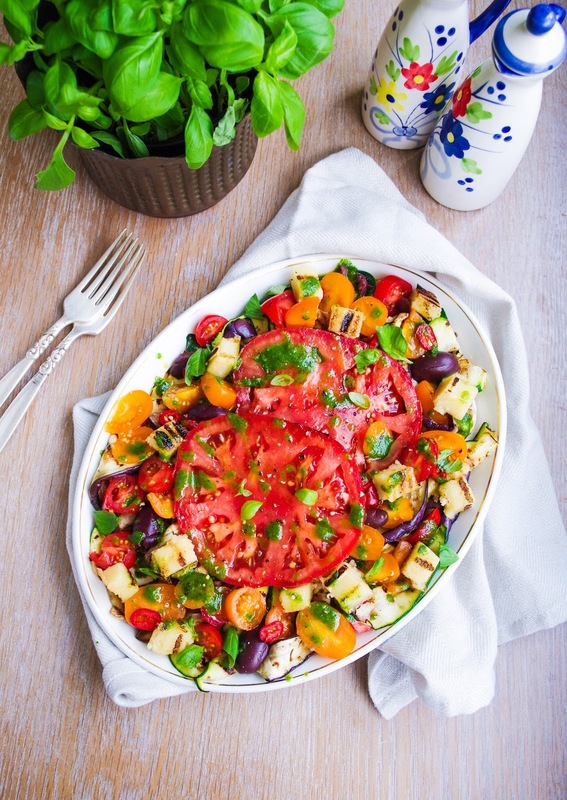 Drizzle the basil oil over the salad and season with black pepper, serve up and enjoy!